#6 steel shot is your best alternative to #6 lead, and can be preferable for use on your own land. The shooting properties are fairly similar, but you’re likely to see penetration and range drop when using steel. The big draw with #6 steel is that many feel it is safer for the environment and can be used in all places that have outlawed lead. 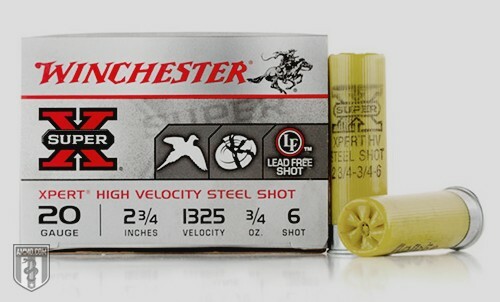 You can get this size steel shot from 10 gauge down to 20 gauge, and at various shell lengths. If you’ve got enough guns at your disposal, it can be worth your time to try various shells with various shotguns until you’ve found the perfect combination. Maybe it’s a 12 gauge with 2.75” shells or maybe you prefer the 20 gauge with 3” shells – whatever the combination, finding what you’re most comfortable with will make your hunting experience more enjoyable. The #6 is one of the more popular shot types for medium to large birds. Turkey, duck, grouse and pheasant are popular targets for this size round – as you can get a great spread at 30 yards with enough penetration to get through the largest turkey vertebrae, giving you a clean kill. When compared to lead, tighten up the range since you’re bound to have a few more runners with steel. Using a dog to help you track down winged birds can be a great plan of action as well. Federal lands and public hunting areas may have a ban on lead ammunition. This isn’t everywhere, but it's continuously increasing. Pay attention to the rules and if you’re unsure, look them up, ask around, or simply use steel shot or an approved alternative. The reason for this is simple: many environmentalists believe lead can leech into groundwater and be eaten by smaller mammals and birds. When other animals drink tainted water or eat tainted small critters, some say they can become poisoned. Over time, this works its way around the local food chain. #6 lead shot will have more power and penetration, and that’s the only true downside to steel. There are some questions about steel causing more wear and tear on your gun barrel, but this only applies to someone firing thousands of rounds per month for an extended period of time. #6 steel is a good shot overall, but if you’re used to using lead, you’re going to want to figure out your limitations. Shoot ten or more rounds at a range or in your backyard (people prefer ballistics gel, but milk jugs make a nice penetration gauge). Get to know what you’re dealing with so you don’t go into the field blindly wondering why it's close, but not perfect.